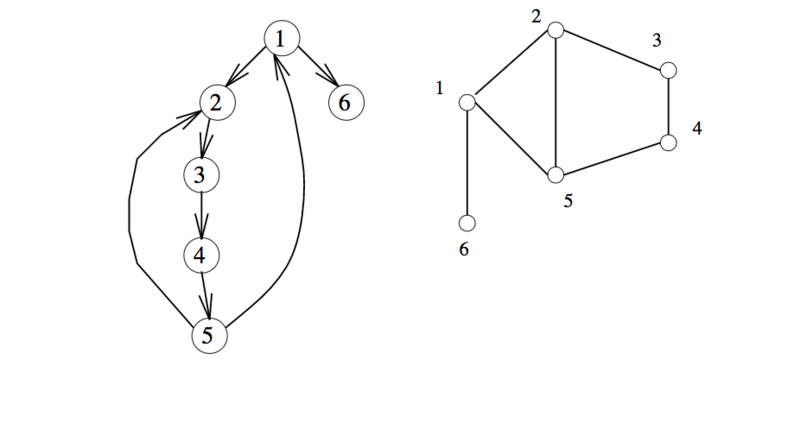 In undirected graphs, each edge (x,y) sits in the adjacency lists of vertex x and y... The labelling of edges as tree edges or back edges occurs during the first time the edge is explored... But when we encounter edge (x, y) from x, how can we tell if we have previously traversed the edge from y? The issue is easy if vertex y is undiscovered: (x,y) becomes a tree edge so this must be the first time. The issue is also easy if y has not been completely processed; since we explored the edge when we explored y this must be the second time. But what if y is an ancestor of x, and thus in a discovered state? Careful reflection will convince you that this must be our first traversal unless y is the immediate ancestor of x--ie, (y,x) is a tree edge. This can be established by testing if y == parent[x]. I mostly find Skiena quite a clear and understandable writer, and I'm pretty sure I understand the business with only tree edges/back edges in a DFS on an undirected graph, and I still find that last paragraph confusing as hell. So I've taken Skiena's C implementation of adjacency-list based graphs + DFS and implemented them in Python 3. I'm particularly interested in commentary that might help illuminate what's Skiena's trying to get across on pp 172 - 173, as well as Py3k feedback (I've mostly worked in Py2.7 for the past few years), or if I'm made any errors. As Skiena goes on to say: "I find the subtly of depth-first search-based algorithms kicks me in the head whenever I try to implement one." An Edge & a Node. The source node is the index of the head in the Graph's edges list. Based on Skiena's Adjacency List implementation. Also available as a gist. Browse other questions tagged python python-3.x graph depth-first-search or ask your own question.